You worked for weeks, (allowing for resistance and perfectionism, maybe months,) to create the perfect lead magnet or talk to build your list. 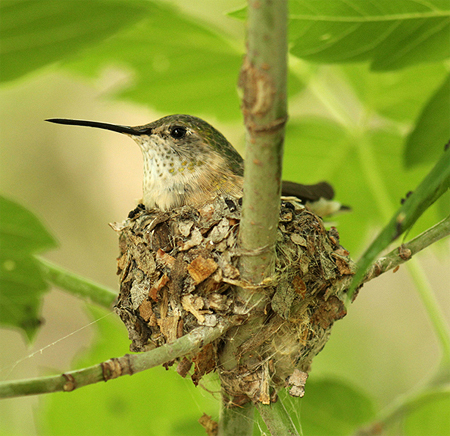 Like a Ruby-throated Hummingbird who builds her nest from bark, leaf strands and silk fibers, you pulled in just the right elements, valuable ideas, and action-oriented suggestions. And just like the Hummingbird whose nest is decorated on the outside with lichen for camouflage and lined on the inside with hair or feathers for insulation, it is beautiful, on-brand, and made to last. Congratulations, they said “yes,” and you have a new subscriber. What happens next is crucial to your keeping said new, interested party engaged for the long haul. If you are not, or if you are relying on an automatic pop-up page provided by your autoresponder with no branding and nothing but “Thanks, you’re on the list,” it’s time to step it up. The basic point of a thank you page is to politely acknowledge the person for their yes and let them know what to expect. If it’s a download and you want them to confirm their email before sending it to them, explain the steps. If you want to give them the download right there, make sure it’s an obvious button or link. If you’ve asked them to confirm their email address, do that and make it easy for them. Have a button or point out a very clear link so they don’t have to dig. This email can have character, your brand voice, an image — just don’t take away from the one thing you want them to do: confirm their email address so you can send them the goods they requested. And build a relationship. To confirm or not to confirm is a bigger discussion than I can take on in this note, but you will get plenty of pros and cons from the almighty G-word. This email is a must, but how you write it is rooted in your brand and brand voice. If you are whimsical you can be casual, sprinkle fairy dust liberally throughout, and include a gif or fun image. More serious B2B types will want to reflect that, but regardless of what business you are in please spend some time on this and have it reflect your style. Recently I signed up for 3 new lists to see how they were doing their first date emails. Two of them gave me access to the download I’d requested and told me what would happen next. Asking people to write something is less likely to get a response than putting a poll inside the email. In this case he could have asked; Which one of these 3 things do you struggle with the most, Content, email marketing, sales copy? It’s easy to click a radio button. Only do that if you really do have different lists for different interests. Nothing is more frustrating than being asked your opinion then being ignored, right? One of the people who does the welcome email really well is Chanteuse Marie. She has 2 freebies. One is a super fun quiz — eerily accurate. The other is an insider look at the funnels of the successful marketers that she shares as screen shots in sequence if you sign up for “FunnelFix.” A unique point of entry, far better than a “10 best list” and she updates regularly; built in-engagement for those who want to get better at email marketing. The welcome email gives you an opportunity to set expectations. What kinds of things will you send me and how often are the two questions you want to answer. This first email is like the feathering part of nest making. You are making it comfortable for the person to be there. Done well the new lead can begin the journey to know, like, and trust. Success in marketing hinges on the rule of 1. One message, for one audience, with one call to action. Otherwise people get overwhelmed and that means less engagement, even though it might seem that offering them more would lead to more. Be thoughtful, be you, help them feel they made a good choice. Best practices will always give you an advantage whether building a nest or a business.